NOTE: Due to reader demand, we will leave this article at the top of the page for a few more days. Scroll down for new articles. “In relation to issues of integrity legislation in governments and so on, we have already put a draft out there, and established a committee under the Chairmanship of Senator Orlando Marville… that committee has already been meeting. They are going to be holding some public hearings. One of the things that has arisen… in Trinidad, only to find after he got into office that that particular piece of legislation has had the unintended effect of stopping most people from serving on Boards and so on, because to become a member of a statutory board you have to do a declaration of assets. So they have found it very difficult to get people to serve in public office based on the declaration of assets. …Barbados Prime Minister David Thompson on CBC Television tonight. Those BizJet Rides Are Addictive… Why Put Rules In Place Now? Thompson and his DLP keep acting like they have to invent the wheel when it comes to ITAL – Integrity, Transparency, Accountability Legislation. I guess he only started thinking about integrity in December when his military supporter did a cut and paste from the internet. Prime Minister Thompson has just informed Barbados that the political and business elites are rebelling in the face of ITAL. Thompson promised to declare his own assets during the election and then reneged. Thompson promised to immediately adopt a Ministerial Code upon forming a government. He did not. Thompson uses private jets owned by entities that do business with the Government of Barbados – a situation that is an obvious conflict of interest with the potential for abuse. No transparency. No accountability. Where is the leadership here? Where is Thompson’s personal commitment to integrity, transparency and accountability? Where Is The Draft Integrity Legislation That Prime Minister Thompson Said Is “Out There”? Prime Minister Thompson stated on national television that his DLP Government has draft Integrity Legislation “out there”. Surely he was not talking about the cut and paste job that his senior supporter in the military gathered from the internet at the last moment of the election campaign? Could it be that David Thompson is not familiar with what he put “out there”? Mr. Prime Minister: Where is this Draft Integrity Legislation that you said is “out there”? By the way do not miss CBC TV at 7:30 on 14th April 2008…….Hon. David Thompson will be ” leveling ” with his people. Will “100 Days” Bring Real Action Or “Studies”, “Committees” and “Consultation”? That’s an interesting choice of words by DLP insider Jerome Hinds as he talks about the Prime Minister’s appearance on CBC TV tonight. But whatever Jerome meant, let’s hope that the Prime Minister isn’t going to try and fool the citizens by announcing “talks” or “studies” on the promised ITAL – Integrity, Transparency, Accountability Legislation instead of real action within the promised 100 day period. So far in the ITAL department, all Thompson and his government have done is failed to adopt a Ministerial Code as promised “immediately” upon taking office. And then there’s the trouble with the Prime Minister’s personal lack of transparency, accountability – and his unethical behaviour in his accepting the use of a private business jet owned by an entity that does business with the Government of Barbados. This bizjet situation unfortunately proves that David Thompson just doesn’t get it. He doesn’t see anything unethical about his behaviour, or any need to publicly justify an action that is against anti-corruption laws in many jurisdictions. He obviously doesn’t get the point that elected and appointed public officials must not only act in a manner that is ethical, but that their actions must also appear to be ethical. Where is the transparency that David Thompson promised the people of Barbados? We’ll be watching tonight. Let’s see if questions are allowed from the media, and whether any of those lapdog reporters have the guts to ask Thompson the type of questions that the citizens of Barbados deserve to have asked. The type of questions, incidentally, that our “journalists” always feared to ask Owen Arthur when he was sober enough to appear on live TV and radio. Tonight and tomorrow will reveal as much about the Barbados news media as it will about our current fears that David Thompson is not going to keep his ITAL promises. 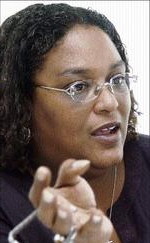 I never said that Mia Mottley is not intelligent and articulate, because in truth she is both. Still, Mia is an impressive speaker who almost sounds reasonable until you step back and really listen to her ideas – not the flow of her words. Because although she is intelligent and articulate, there is that smug elitism, that “We know what’s good for you better than you know yourself” attitude that permeates her thinking.